Pierce had his first day of school last week. Here he is waiting for the bus on his first day, full of excitement. Aside from the fire drill (he hates them), he had an excellent week. This year, Pierce was allowed to take a water bottle to school to keep at his desk. Camelbak sent us some nice, BPA-free ones. 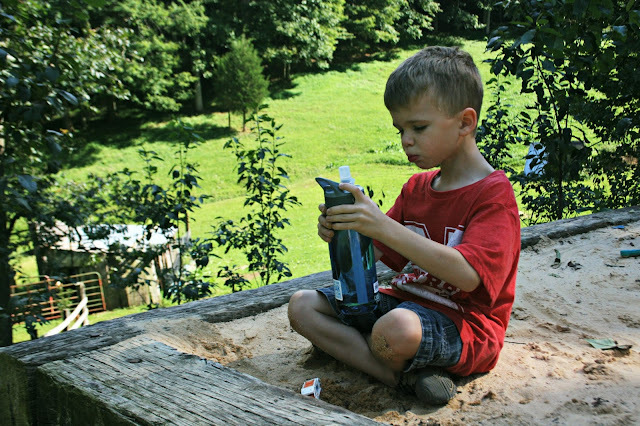 I have been using their Eddy bottle myself for over a year, and it is very durable and spill proof. When kids get dehydrated, they don't think as well, so I'm glad to know Pierce will have water when he needs it. In our back to school preparations, Paul welded some hooks for the backpacks from old horse shoes. Didn't they turn out cute? 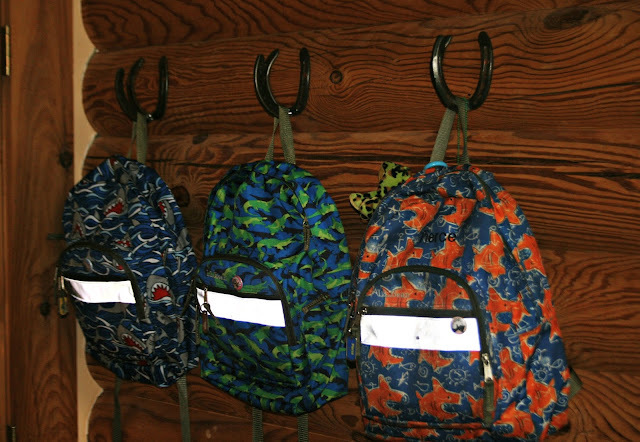 I figure they are sure to have a lucky year, with their school backpacks on hooks like these! If you are interested in having a similar hanger, you can find them in the Two Bears Farm Etsy shop. Poor Cort and Reid, they have to wait until after Labor Day to go back to their 3 days a week preschool routine. Boy are they ever bent out of shape about it! It's just not fair! Readers, have your kids (or grandkids) gone back to school yet? Disclaimer: I received two Camelbak Eddy water bottles for back to school purposes. The opinions above are my own. Pierce looks so cute -- have a great day Lisa. Pierce looks so excited! I'm glad he had a good week at school. My grands all seem to be having a good first week too. The hubs uses a Camelbak water bottle too- they are very durable! I like the photo of Pierce waiting on the bus with the dog. I remember our daughter climbing on the bus with a backpack as big as she was. I am glad they allow a water bottle at his desk. I know up until recently they did not allow the high schoolers to bring in reusable water bottles. They had to buy water from the school cafeteria. I love your back pack hooks. Everything in its place. That's a great start to organization for the boys. My oldest granddaughter started back to school. She is in first grade also. My grandson starts back to preschool in September. what a fabulous shot of Pierce and your dog, and everyone should have horseshoe pack hooks, what a clever idea. Nope school is still out here. Nice dog waiting for the bus with Pierce! Awwwm, Pierce looks SO cute. Such a big boy now in first grade! The photo of him waiting for the bus with his dog is just priceless! The hooks are just the cutest thing....and anything that helps us/them stay organized is a good thing. Yes my boys are into their second wk. I posted about it on my WW this wk. Isaak started Kindergarten and Mica started 2nd grade. I just love those hooks! Pierce looks so cute and ready for his big day. I think those horse-shoe bag hangers are pretty interesting. I think Iam more excited when school's re-open as then life gets more disciplined LOL. Awww, what a cute first day of school picture! And even the dog seems sad and seems to know he is going. Never knew you could buy water bottles with purifying filers in them!! I really do love those hooks...are you still thinking f selling the house? I think I had forgotten you had an Etsy shop, so you have been to China? Or maybe the crumb catcher was acquired some other way. Yet another thing I have never heard of!! I thought it was a hand mirror at first. And i love those hooks! Very fun.. and lucky for sure! JDaniel is supposed to have a water bottle too. He started yesterday and loved it. It's been a long, long time since mine were that age but I remember how worried we were that they would not be happy at a public school. In the end we wound up home schooling. My youngest grandson started Tuesday... he was so proud and happy to be a kindergartner! That is such a good picture of Pierce with his dog. :-) I hope he has a great year at school. And hope the twins can hold on until after Labor Day! Those hooks are great! That's a wonderful way to store things so they can be found! Water bottles at the desks--I like that! I bet kids do get dehydrated sitting in class for most of the day. He just looks so pleased about school. Too cute! I like the horseshoe hooks and you have an Etsy store? Neat! Pierce looks like a regular scholar, complete with water bottle and dog (thought I suppose the dog doesn't get to go to school). Yes, your boy is growing up on you. Our grandchildren are home-schooled, and I suspect schooling won't start until the house is a little more settled. Hard to focus on school when surrounded by the noise of workmen renovating the place. Awww how cute! Love how he is posing with the dog :) My husband is a teacher and just started back to school yesterday. Love the backpacks and Pierce's photo with the dog is precious. Pierce looks excited and happy! How cute he is all ready for school. Cute Hangers for the back packs! 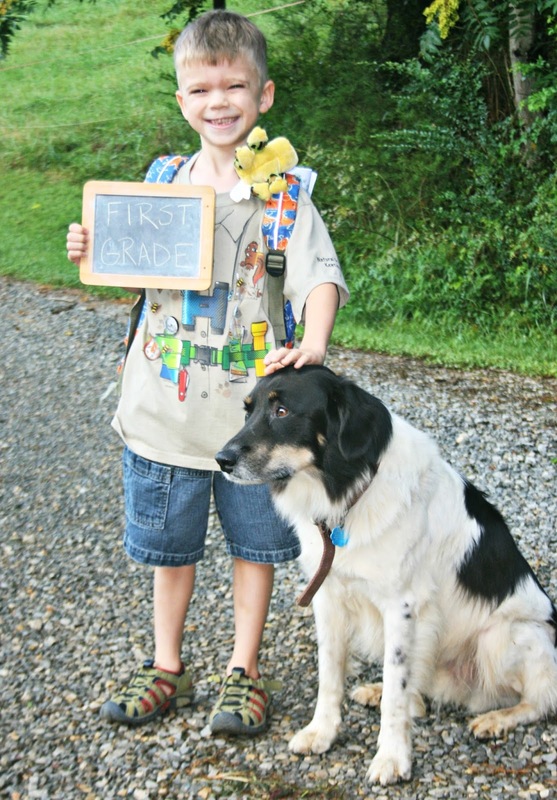 I hope he has a great experience in first grade!!!!!!!!!!!! That is a great picture with the small chalkboard! Hi Lisa, Pierce looks so happy and proud of himself... How neat to be a First Grader!!!! Love your backpack hooks... Neat!!! Hope everyone has a great school year!! Tugs on those purse strings a bit doesn't it Mom? Back to school, hurrah! My son is getting so excited, and yours looks happy too. The hooks do rock, what a great idea.